What Does the Solyndra Bankruptcy Mean? No one knows for sure why the solar panel manufacturing company, Solyndra, went bankrupt or what it means, but Congress is now investigating the matter. Though it will be useful to know what went wrong, bankruptcies in these tough economic times are not unusual. It is not clear why Congress is investigating the matter, but if the investigation is used for political purposes, it may delay our development of renewable energy resources. This could further hurt our economy and actually cause the loss of jobs. In spite of the fact that the Solyndra bankruptcy may have cost 1000 jobs, that is a small amount compared to the hundred thousand plus workers who now work in the solar energy business in United States. 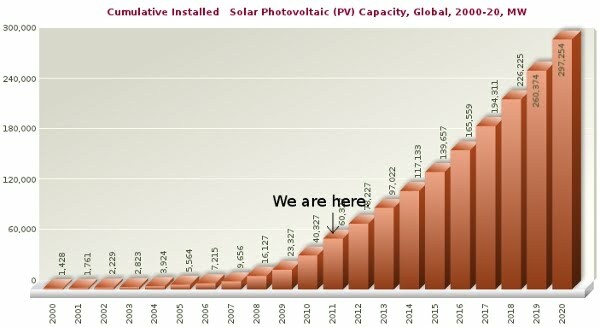 Solar energy is one of the fastest growing industries and the graph above from this article estimates that the use of solar energy will increase fivefold by 2020. If the United States does not invest in the production of solar panels, it is almost certain that other countries will. China has set aside $34 billion to be invested in the production of solar panels. The $500 million in loan guarantees to Solyndra is rather small compared to that amount. Unfortunately, the US investment in solar energy may be derailed by Congress. In spite of the other problems facing our nation, Congress has now launched a Congressional investigation into the Solyndra bankruptcy. It would seem that the investigation is politically motivated with the goal of embarrassing the Obama administration and derailing our efforts to reduce our dependency on fossil fuel. The Department of Energy has made a number of loan guarantees for investments in green energy projects and this is the only one which has had a serious problem. A number of large and savvy investors put over $1 billion into the Solyndra, so it cannot be claimed that it was was a bad investment from the beginning or that the company was supported entirely by the Department of Energy. Also, the political ramifications are not quite clear, as this timeline for the loan approval process for Solyndra shows it started in 2005 under the Bush administration. The U.S. government expects to earn $5 billion to $6 billion from the renewable-energy loan program that funded Solyndra LLC, supporting President Barack Obama’s decision to back low-carbon technologies. The results contradict the widely held view that the U.S. has wasted taxpayer money funding failures including Solyndra, which closed its doors in 2011 after receiving $528 million in government backing. This entry was posted on Tuesday, September 20th, 2011 at 10:50 am	and is filed under Energy and the Environment, National Politics. You can follow any responses to this entry through the RSS 2.0 feed. You can leave a response, or trackback from your own site. You may quote my articles. Please check out the fair use policy on the copyright notice. My son, who is an IT specialist, designed it for me. Sure. Please check the copyright notice for the fair use policy.. Sorry, but it is not possible. You are not among the registered users. Can I just say what a relief to discover a person that actually knows what they are discussing on the internet. This post provides clear idea in support of the new users of blogging, that genuinely know how to do running a blog.